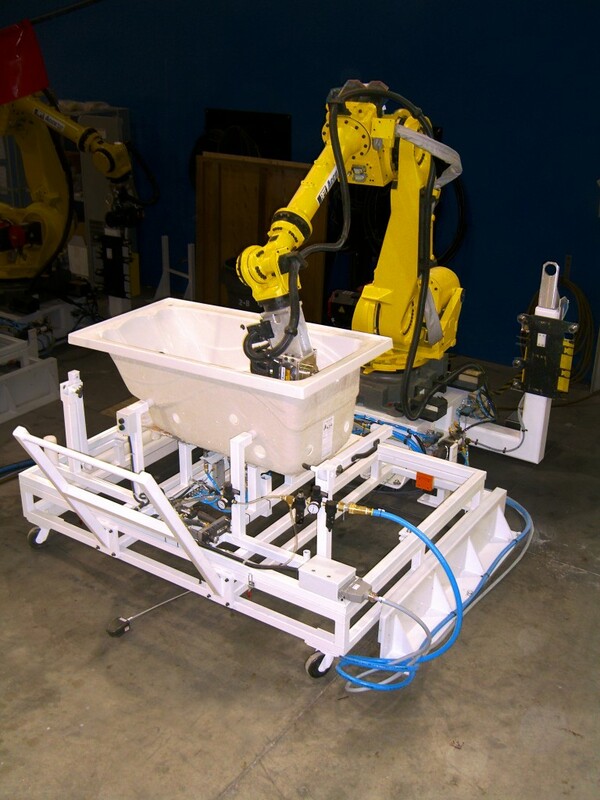 TBD Enterprises provides robotic router trimming systems designed to help manufacturers trim more parts per hour, reduce downtime and improve employee safety. These path intensive applications require a special knowledge of what it takes to create a reliable, repeatable and flexible trimming solution. Robotic trimming systems typically remove personnel from demanding tasks that require attention to path detail or replace CNC machines that are most costly to operate. TBD Enterprises’ partner has extensive knowledge of router trimming processes and access to the latest robotic technology. Robotic routing is a fast and efficient material separation process that takes place when a router bit, attached to a high-speed routing spindle on the end of the robot, is driven into a part and robotically guided along the area to be trimmed. The router, which produces a very clean edge in plastics and composites, can be programmed to cut through the part completely or trim the material to a predetermined depth (ie. Weakening the carrier of an instrument panel around and airbag pocket). The AccuTrim® R-Series router trimming robots easily process complicated three dimensional parts that trim presses can’t. The robotic systems can also produce more quality parts per hour than CNC Routers because tool changes, high speed air moves and fixture changeovers are accomplished more quickly and easily. In order to produce the best quality cut, it’s essential that a part be placed securely onto a well-made fixture. Mechanical clamps, vacuum cups and vacuum systems can be used to achieve this. The RouterVac vacuum system can also be used. It was designed to not only secure the part, but to remove dust and chips produced during the trimming process. Materials like fiberglass, polypropylene, instrument panel substrates, composites, polycarbonate/PCABS, gel coat and FRP, low pressure molded polypropylene, vinyl, acrylic, wood, and SMC (as well as some others) are ideal for router trimming. Router bits cut cleanly through thick materials without leaving burrs. Contact TBD Enterprises to speak to us to determine if the Router trimming and cutting process is for you.